It’s time, the brand new Podgressive EP032 is here! Wow, it’s already in the end of July. What happened to the summer? We hope you are having a great time at the beach, work or whatever you do right now. 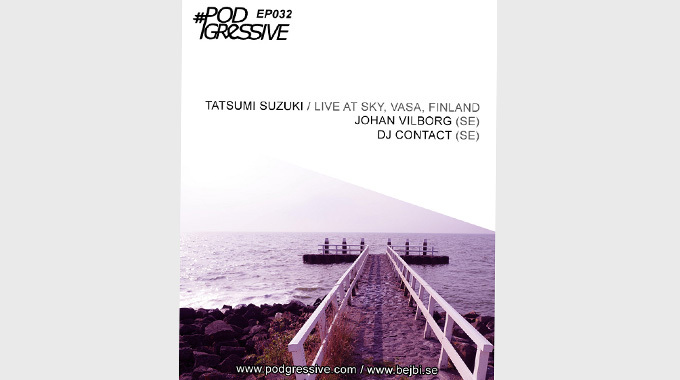 This month episode of the #podgressive podcast comes in three parts, as usual: Two guest mixes and one mix from our host, Tatsumi Suzuki, this time it’s a live recording from his gig at Sky in Vasa, Finland in July 21:st! The two guestmixes comes from two Swedish dj’s, the Trance-dj; Johan Vilborg (bejbi.se interview here) and Drum & Bass-dj; Dj Contact. So fill up your mp3-player, phone or stream it live from the page, you’ve got some great music for the rest of the summer now! Enough with the talking now, head over to #podgressive.com and get your own copy! DON’T FORGET TO GIVE YOUR SUPPORT BY WRITING A COMMENT, SHARE AND LIKE THIS EPISODE. ALSO INTERACT BY USING THE POLL AND SEND US YOUR SHOUT OUT’S AND REQUESTS TO djtatsumisuzuki@gmail.com.